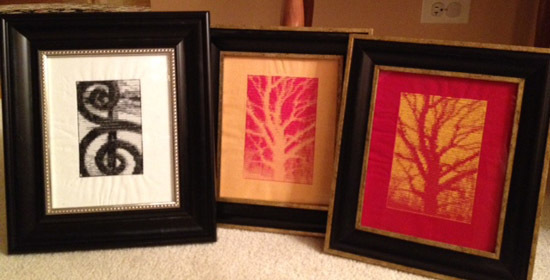 Inspired by Amanda’s Software Sampler webinar, these were a real surprise for me. I wasn’t originally in love with PhotoSnap (included with BERNINA Embroidery Software 6), but after playing with it a bit, I found some things that really work for me. I take a lot of photos, and black and white pictures are some of my favorites. I guess I have a real preference for abstract nature/geometric/strong black & white art. The trick with PhotoSnap is to use very high-contrast photography. I use only black and white. I have access to PhotoShop at home, but the contrast adjustments can be made using the Corel software which is a part of BERNINA Embroidery Software 6 along with PhotoSnap. The real key is to start with a very strong simple graphic. Lights and darks must be very pronounced. It helps to squint at the photograph – you can see right away what will turn to gray mush. Once the image is converted in PhotoSnap, it’s just a matter of adjusting stitch size and angle to get precisely the right look. Generally, as soon as the image is converted, you can tell onscreen whether it will work or not. From there, it’s just tweaking. I also spend some time adjusting stitch density, as these can become very large files. Finally, choosing fabric and thread color is as much a part of the design as the photo. The photos in the picture are from my neighborhood. The wrought iron fence was on a farmer’s tomb down the street. And the tree photo was taken in late fall along the bike trail. 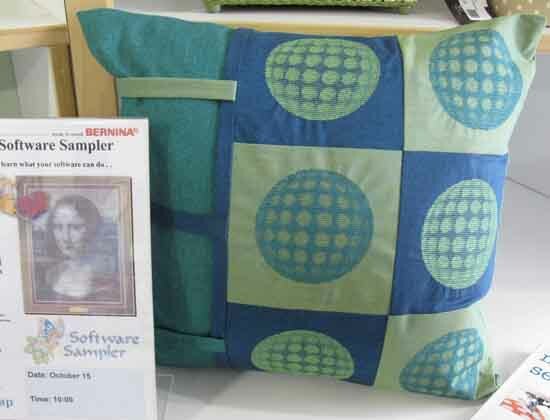 PhotoSnap is available in EditorPlus and DesignerPlus levels of BERNINA Embroidery Software 6.